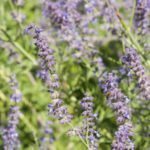 In the New River area, how often should you water Russian blue sage and when should you prune them back? It is now the beginning of January and the blooms on most are done. Also should Mexican bird or paradise be pruned back now and to how far above ground? Pruning can take place after the flowers have faded. Watering is minimal with established plants. If your plants are new, they will need regular irrigation. Pruning your Mexican Bird of Paradise can take place after blooming, generally during winter.